The Aerogarden Ultra dies, Pesto, and Old-school Indoor Gardening. It's been a while since I posted an update to the blog, and it's for sad reason--my Aerogarden Ultra is dead. It happened while I was away from home. I left the house for a week and when I returned, the unit's lights were out and a faint burning smell was coming from the bottom of the unit. Thank heavens the house didn't burn down. Now if you "recall" (pun not intended, but it would have been a good one if it was :P), there was a notice from AeroGrow to AeroGarden Ultra owners back in June, warning that there was a problem with the design of the unit, but if you sent away from a free replacement for the base plate, that problem would be all fixed. Well, as you recall from my post in June, I sent away for the replacement and installed the new base plate. But it looks like that didn't solve the problem at all, because all the symptoms they were describing of water overfilling and shorting out the unit seems to have applied in my case. Worse, I was one of the first people to buy the AeroGarden Ultra back in December 2012, so my one-year warranty just expired not too long ago. But since I bought it with my Discover Card, and they have a warranty extension program, I called them up. They'll be sending me a claim form, which hopefully will help me get what I paid back for it, maybe I'll apply that towards one of those over-priced Aerogarden Ultra LEDs so I can review that for you. But I have to say, I'm not impressed by the engineering of the Aerogarden Ultra, nor of the "fix" that they put in place. In the meantime, my Aerogarden 7-pod classic system (the one I installed the replacement bulb in for my last post) is doing well. I am down to one basil plant in it, but it's still going strong. I harvested a bunch of basil and made pesto for the first time in a while. 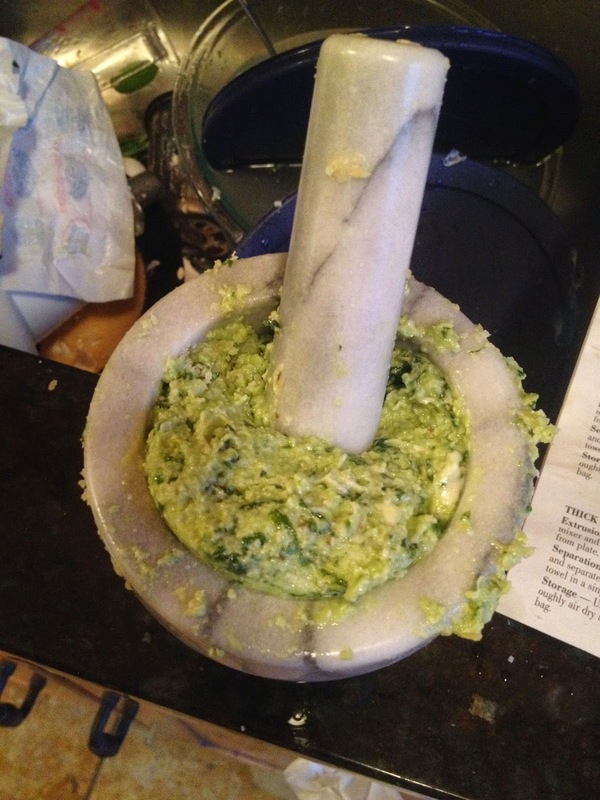 All hand-crushed, the way it should be, using a mortar and pestle my sister got me for my birthday. In other news, I work in Manhattan with an office that gets a LOT of sunlight every day--so much that it warms the office up, as Al Gore might say, by several million degrees. Two weeks ago I went to the Brooklyn Botanic Garden, which has a fabulous plant sale every year. 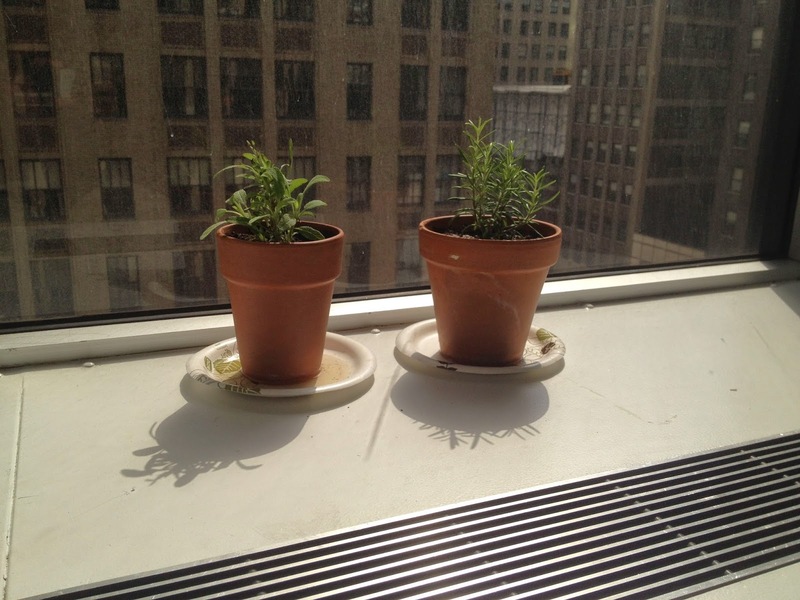 I bought a sage plant and a rosemary plant, and decided to bring them to the office, old-school style.